Providence has a large Portuguese population, so Chouriço is easily found on the supermarket shelves. One way I like to use it is in macaroni and cheese. Most recently I made this as a Thanksgiving side, and like turkey, it makes for fantastic leftovers. Bake it in ramekins and refrigerate or freeze the individual portions. Cut one or two chouriço (or chorizo) sausages in quarter inch dice. Cook in a frying pan until it begins to crisp. 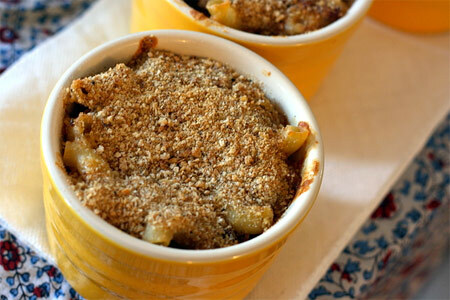 Prepare your favorite mac and cheese (the recipe I usually use is adapted from this one on the “Heluva Good” cheese website). Stir in the sausage before it goes in the baking dish. Bake and enjoy! Oh, this is a favorite of mine, too! See here. Wow, that looks and sounds absolutely delicious. I usually just eat Chouriço like a sausage.. throw it on a roll with a little mustard. I’m going to have to try this Mac and Cheese combo.